In 2010, we discovered California (Twin Peaks) little wild brothers, Sol and Val at a large holding facility for captives near Reno. The 2 babies were screaming after being torn from their mamas by the wranglers. We searched for their mamas but the BLM employees didn't know who their mamas were. We saved the colts, vowed to keep them together forever and we have. Blondie (Fox Hog) and Tibet (Divide Basin, WYO) were long-yearlings facing their 3rd strike from the BLM's failed adoptions in 2012. 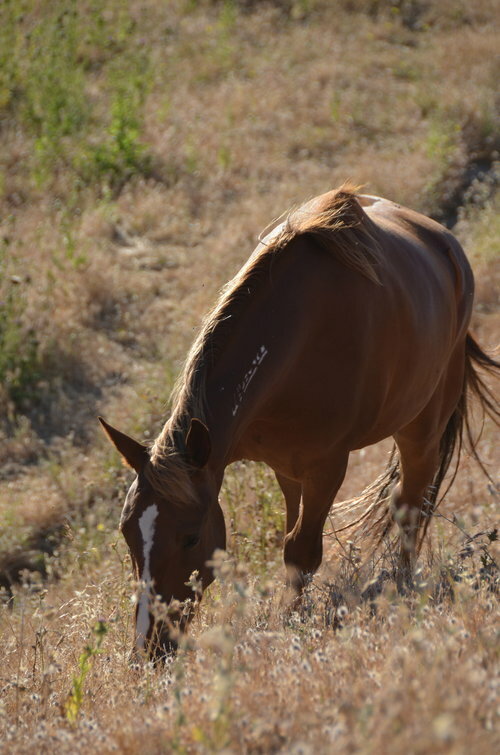 After 3-Strikes, captive wild horses lose their protections and can be killed or sold by the truckload for meat. We waged a huge awareness campaign to educate the public about 3-Strike wild horses being sold for $10 a head by the truckload to foreign slaughterhouses. Our campaign found homes for many wild horses while educating the greater public on the BLM's 3-Strikes nightmare. Blondie and Tibet were about 18 months old and had not found homes. We couldn't risk for them to end up on a kill buyer's truck heading to Canada for slaughter so we took them in. Amore was born wild and free in Nevada but ended up in the hands of an Oklahoma kill buyer who bought her at auction. She was going to be trucked to Mexico to be slaughtered for human consumption--a delicacy in Asia and parts of Europe. Her previous owner brought her to the auction with braids in her hair and a note about her shots, shoes and kind temperment. I don't think they knew she could end up in the hands of a KB but that's what happened. Amore suffered a lot of trauma and will never be "used" again. Now Amore, Val, Sol, Blondie and Tibet board on a peaceful farm at the base of Mt. Diablo State Park, in Walnut Creek, California. The farm is a sanctuary for many kinds of wildlife from quail and rabbits to deer. Several fawns have been born in this peaceful setting as well as ducklings in the spring.